You don’t need to pay attention to your post slugs — but there could be real traffic benefits if you do. They both get the job done, but one is short and easy to read, while the other is long and unwieldy. 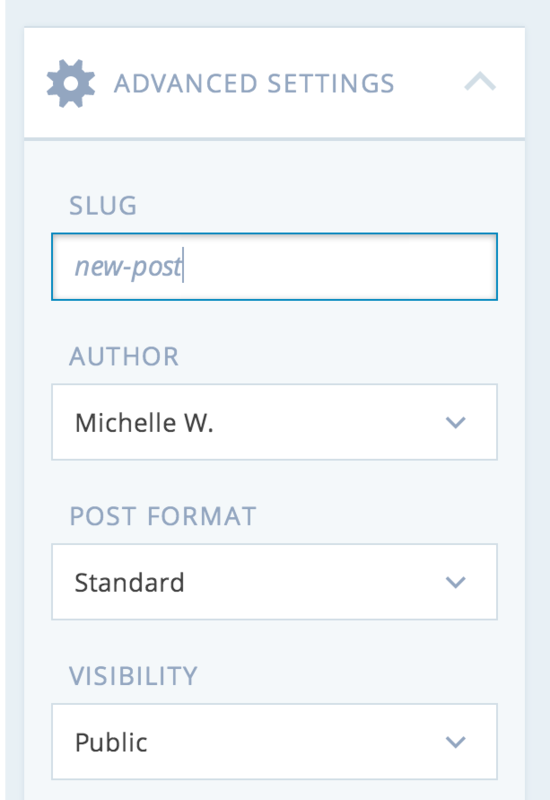 Think about what the auto-generated slug would look like for “Perennial Favorites: Should You Connect Your Blog to Your LinkedIn Account?” or “Recommended Reading: What I Talk About When I Talk About Running,” and you’ll start to see how easy it is for post slugs to bulk up. First, it makes an easy-to-remember, easy-to-share URL, and lets the person with whom you’re sharing the URL — or the person who sees the link out in the wild — understand the focus of your post quickly. And when we know what we’re getting into, we’re more likely to click. More importantly, Google likes a short, focused slug that contains the key words describing the post and not a lot of fluff. Slugs are important to search engine rankings; the fewer keywords your slugs contain, the more highly they’re valued. Google is smart — it knows that a long title and slug have lots of filler words (from a search engine standpoint), so it gives the words less weight. It’s full of words that make for an interesting title but are meaningless from a search perspective: all, about, not, the, slimy, and kind. If you were looking for information on post slugs, you wouldn’t search for those terms and the Google Wizards know it. Make your titles as fun, funny, titillating, or descriptive as you want — then edit your slugs to make them succinct and focused. If you’re writing in the new visual editor, you’ll find the post slug under “Advanced Settings,” the last option on the right-hand side of the page. “Slug” is the first field — enter your text, and it will save along with your post text. Keep it short — five words or less — and limit it to words that actually describe what the post is about. Remove “stopwords.” Words like the, in, a/an, is, and it don’t tell search engines anything about the focus of your post, so they’ll be filtered out. You want to keep your slug focused, so don’t waste a word on something that search engines will ignore anyway. No punctuation. Slugs are lowercase letters and numbers only. Punctuation will be automatically removed, which could leave you with meaningless words (“doesnt”). It only takes a second to edit your slug, but Google will thank you! Note: Changing the slug of a post that you’ve already published means that all existing links to that post will stop working. Make sure you update all links with the new URL if you decide to retroactively modify your slugs. Appreciate the tip – I’ve had the long unreadable slug issue before, good to know it can be fixed! Thanks for detailing this. I recently found out it was possible to change the URL, but hadn’t had a chance to look up how. This showing up in my reader feed was so timely. I have never thought of that! Thank you! i tried changing the URL twice on my other site http://www.pathsonwater.wordpress.com and every time i did, it messed up my post….so much so that I had to edit and create the paragraphs and spacing again. Great post. I myself have tinkered with the slugs on post before especially when I decide to change the title later on. I think it updates now but in the past it did not. I don’t use it that much now because I try to keep my titles simple with mostly the key words the post is focused on. I’ve edited my post slugs before when they were ridiculously long, but I didn’t know they affected searches. Thanks for the information! Cheers for this implement, I’ve been struggling with the to the point titles vs. whimsical ones dichotomy until now. However, is there any reason why the slugs can only be edited in the new visual editor – or why there are two different editors to begin with? You can edit the slug in either editor — take a look at the screenshots in the post. We’re working on making the visual editor cleaner and more intuitive to use, so are starting to roll out some changes. For the time being, you can opt to keep using the classic editor. Google’s never thanked me in the past. Why would it thank me in the present? Is there any difference between permalinks and slugs, or are they the same? Because in the editor (just below the title), it shows permalink and not slug. I’ve been using bitly.com, and see in the popup of generated shortened URL’s I can make a personal link. Would that be kind of the same? I also thank you for this info! I’ll give it a shot. That’s a nice touch, but search engines are looking at the actual, original URL of your post, so make sure that link is well-formed, too. Great post – a very useful tip and pretty easy to remember. As a lover of the long post title I really needed this and didn’t know how to fix it. Thank you! I’d never even thought about this before! Great piece of advice, thanks! Now, lets see if I remember to do it when I next post! I like changing them. Just because I don’t like what it automatically generates. When I change it I’m being creative too. So I’m glad that I’m able to do it. If you know how take advantage of it. I have now changed ALL my slugs, and you know what? It was really cool! Instead of having those mile-long adresses that now are much more to the point. I have said thanks once, but want to say it again since it was super helpfull, and I would never have figured out this on my own. I know it’s probably me and take full responsibility, but I can;\’t (even) find the ‘edit’ button to change the slug post! Help! Thanks so much for the response. You made perfect sense, the question remains, can I do it? I appreciate your taking the time to respond. I appreciate that. I’m always concerned about something disappearing into the ethers of cyberspace. I did it! I am so happy! Thanks for the instructions and the encouragement. Awesome. I’ve noticed that when I started doing this, I’ve been getting more traffic on my page. That’s exactly it. It takes the fun away if you are stressed about it. Wow! It’s a gr8 tip, blogging since last 8 yrs with wp but never ever thought abt slug. Yea! LOVE THIS!! Was just blogging about SEO and this would be a great way for me to be as ridic as I want in my titles and yet have good SEO with my links. THANKSSSS!!! Thank you so much for that slug of advice! I forgot all about this! This helps tremendously! Thanks, did not know what slug was either.